A seven-day admission fair has started at the University of Development Alternative (UODA) for the admission seekers in honours and masters programmes. The fair began on Sunday and it will continue until 15 September, says a press release. 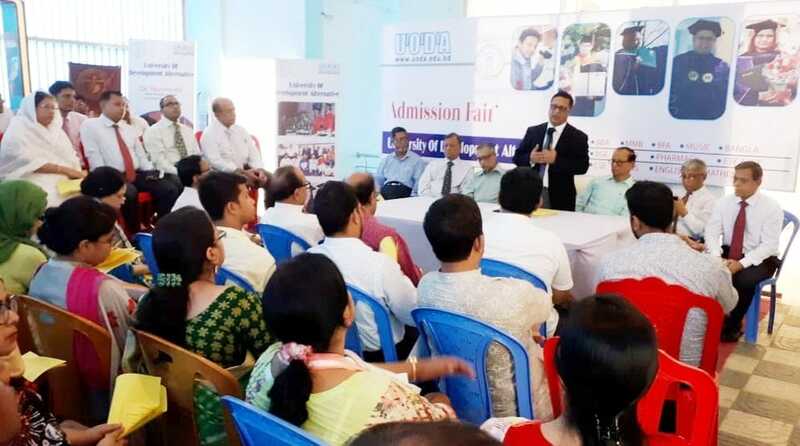 The admission fair will remain open from 9.00 am to 5.00 pm at UODA Registrar Office (80, Satmasjid Road, Dhanmondi, Dhaka) and UODA CSE Department (3/C Satmasjid Road, Dhanmondi). On the occasion, the university authorities held a press conference at the campus at Dhanmondi in Dhaka on Sunday. UODA founder and president Professor Mujib Khan addressed the press conference. Vice Chancellor of the university Dr Rafiqul Islam Sharif, Pro-Vice Chancellor Prof Dr Ahmedullah Mia and Registrar Prof Dr Iffat Chowdhury were also present, among others. Prof Mujib Khan mentioned that the university does not have any commercial tendency with the education from the beginning. “We do run our institution on the basis of non-profit policy as we think education is not a commercial matter, it is a right for every citizen of the country,” he said. He announced that students can enjoy 'Tk 5,000 cash back offer' for admission during the fair. "Three per cent student will get 100 per cent tuition fee waiver under freedom fighters' children quota in this university," Mujib Khan said. Poor and brilliant students from rural areas will also get the same opportunity, he added. The UODA founder assured that parents of underprivileged students can fix educational costs after discussing with the university officials. “Authorities will consider economical condition of students' families, educational background to fix the educational costs,” he said. Mujib Khan also informed that the students having GPA-5 in both SSC and HSC examinations will get 50 per cent tuition fee waiver. If a student has GPA-5 SSC or HSC examination, he/she will get 25 per cent waiver. The university also offers different scholarship in honour of the freedom fighters, language movement martyrs and some eminent personalities.